Melt-in-your-mouth, moist and delicious roast pork that you’ll make over and over again. Use a different variety of fruits – dried giant raisins, apricot, plums, cherries, etc. It’s your choice. I love my slow cooker as it’s a very reliable ally in the kitchen. While I have used it for a variety of recipes including desserts my favorite dish to cook in my crock pot is a roast. I love the result of melt-in-your mouth tender meat that is so moist and full of flavor as a result of long hours of braising. It just has never failed me so far and my family is always delighted with the outcome. So when I got myself a huge piece of bone-in pork shoulder, nearly 8 pounds, (that was the only one available at the time of purchase) I knew I would use my slow cooker to make a fruit-flavored roast pork. I am glad I did as you can see in the photo below that the meat came out so moist and truly flavorful, too! Please enjoy! Melt-in-your-mouth, moist and delicious roast pork that you’ll make over and over again. Use a different variety of fruits – dried giant raisins, apricot, plums, cherries, etc., it’s your choice. 1 bone-in pork shoulder, about 6-8 lbs. Trim the roast of extra fat (or fat cap) if you prefer or leave it as is. I left the fat on so the meat bastes as it cooks and for extra flavor. Liberally season the pork shoulder all over with salt and pepper. Heat the oil over medium-high in a large frying pan then brown the pork well on all sides. Transfer the browned pork to an 8-quart slow cooker (if cooking a 7-8 lb roast) with the fatty side (fat cap) on top. In the same pan, pour in the chicken broth, dry sherry or white wine and orange juice. Deglaze the pan and stir to scrape the browned bits at the bottom. Add the brown sugar, stir and bring the liquid to a boil. Pour over the meat. Sprinkle the dried fruits around the side of the meat and stir if needed. Cover and cook on low for 8 hours or until the meat thermometer registers an internal temperature of at least 145 F.
Transfer the roast to a serving platter and spoon the fruit and a little of the sauce all over. Serve immediately. You can use just half the size of the roast I used (about 3-4 lbs) and to adjust simply halve the ingredients and use about 3 cups dried fruits. Cook for 6 hours on low or until the meat thermometer registers an internal temperature of at least 145 F. I usually make the roast a day before I serve it so the meat would absorb more flavor. I refrigerate it overnight so the next day I simply skim-off the fat that has risen on top to lessen the grease and make it a little less calorific. What an incredible idea to use dried fruit in this. I bet all the flavours are amazing when they are slow cooked. I love that you used dried fruit. I can just imagine how delicious this pork will be. Hope you enjoy it Christie! Thanks! 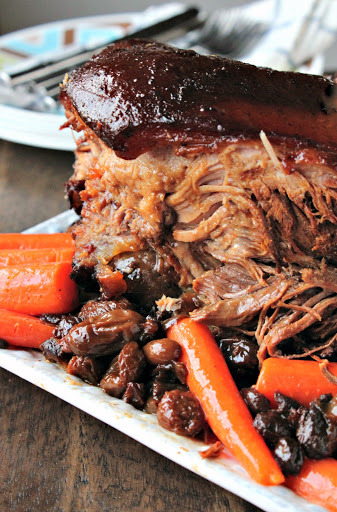 I love slow cooker recipes and I love using pork shoulder in the slow cooker! It is usually cheap, and can be transformed wonderfully. Loving what you did here! What a gorgeous roast, Abby. It is just spectacular and fall off the bone delicious. I know those dried fruits make it sweet sweet! How I would love a forkful of this tender roast! And so easy! This looks absolutely fantastic! I'm adding it to the menu rotation…I know I am going to love this! I'm going to use all apricots when I make this! YUM! Oh my goodness, this is making my mouth water! It looks and sounds absolutely terrific! 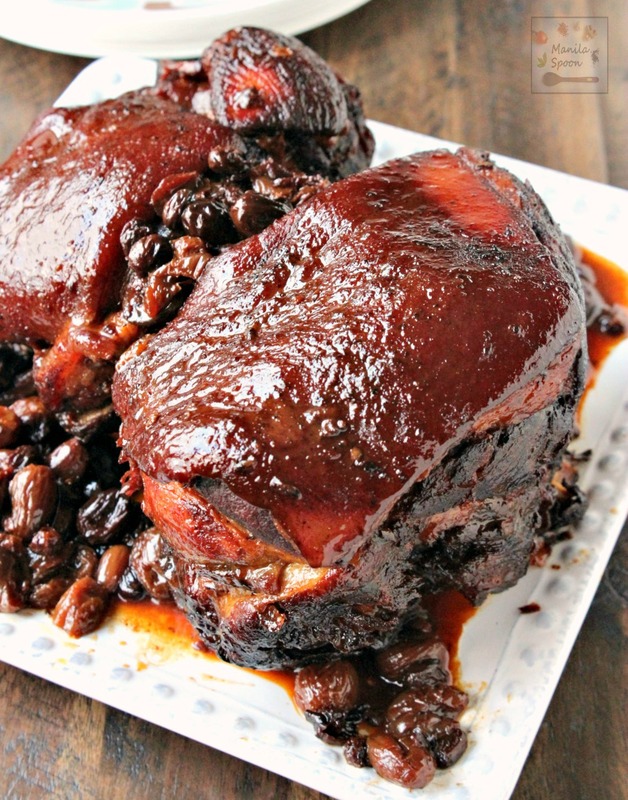 What a great idea to add dried fruit to crockpot pork! I recently got a dehydrator for Christmas so I guess I could even make my own dried fruit. What a mouthwatering recipe! 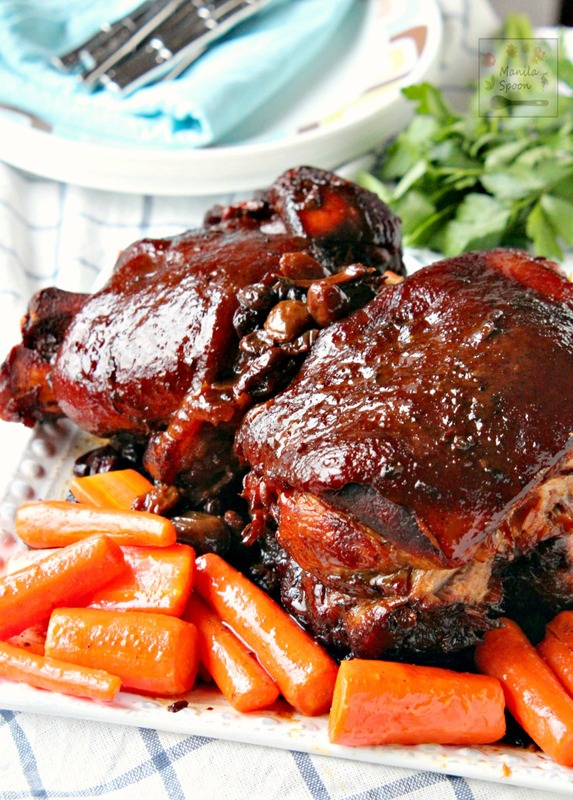 Love my slow cooker and you are making magic – this looks incredible! You are calling my name with this dish. Just mouth watering. I love the idea of dried fruits with pork. love love this!!!! WOW! What a mouthwateringly delicious dinner! This reminds me of being a kid. And, it'd be great for making when I have the whole family over! Thanks for the recipe. A slow cooker really comes into its own with roast meats, doesn't it. Loving the sound of your recipe! I love the dried fruits in this! That roasted top just made my heart bit faster! So excited to have a new slow cooker recipe to try, thank you! Love the combination of flavor going on here. Looks inviting! That Slow cooker Roasted Pork would fly off our table! I actually think I have most of the ingredients to do this on hand and will definitely be making it soon. What a stunning meal Abby! Perfect for Sunday Supper and holiday dinners. I can only imagine the depth of flavor the addition of dried fruits brings to this dish!